The Termination of Pregnancy Bill passed by 102 votes to 12. 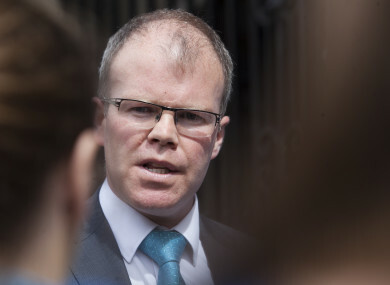 DISCIPLINARY PROCEEDINGS ARE to be initiated against Sinn Féin’s Peadar Tóibín, who broke ranks with his party’s policy by voting against the abortion legislation in the Dáil today. As indicated by Sinn Féin party leader Mary Lou McDonald in April, Tóibín could face suspension from the party. However, Tóibín told TheJournal.ie this evening that “this issue is far more important than my job or any job in Leinster house”. The first vote on the Termination of Pregnancy Bill was held today with the Dáil voting by 102-12 to pass it to Second Stage. The Dáil also approved that the Bill be sent to the Oireachtas Health Committee for discussion. A number of TDs, who campaigned for a No vote in May’s referendum, voted against the Bill today. There were also seven abstentions. The whip will now contact the party chairperson. The chairperson will initiate disciplinary procedures against Peadar Tóibín for his breach of the party whip today. This process will conclude in the coming days. When TDs vote in the Dáil they are individually and personally responsible for the outcomes of the laws they vote for. This is a sobering responsibility that can’t be ignored. I have been a member of Sinn Féin for 21 years. From a young age I was incredibly inspired by the selfless sacrifice of generations of republicans from Wolfe Tone to Bobby Sands. I joined Sinn Féin when it was not easy to join Sinn Féin. In the intervening years I have poured all my energy into building a movement to achieve a United Ireland and economic justice. He said he will seek to amend the abortion legislation at Committee and Report stage. “I will seek to stop Simon Harris forcing doctors and other medical professionals to provide or arrange abortions,” he said, adding that he will seek adequate reporting on par with the British system so that policy makers and the general public in future understand what is happening in the Irish system. Before the referendum, McDonald said that irrespective of party members’ right to articulate their views on the issue of abortion, the party has “clearly drawn the line” on the matter of breaking the whip when it comes to legislative proposals and public policy. “That is the point where elected representatives of Sinn Féin have to separate our private conscious views we have held with our public function and public role, that is the distinction,” she explained. McDonald said party members that breach the party line will face consequences. This is something all members are aware of – including Tóibín, she said. Sinn Féin policy is crystal clear. There isn’t an a la carte position. We do have people in the party that have a different view, and they articulate that different view. What will not happen on my watch is any ambiguity in terms of the absolute requirement to vote in the Dáil or Seanad chamber in accordance with Sinn Féin policy. While Carol Nolan left the party for voting against her party, there had been suggestions that Tóibín may only face a suspension from the party for a period of some months, rather than permanently. The other 12 deputies that voted against the Bill today included: Sinn Féin’s Peadar Tóibín, Fianna Fáil’s Marc MacSharry and Eamon O Cuiv and Independents Mattie McGrath, Danny Healy-Rae, Michael Healy-Rae, Michael Collins, Sean Canney, Michael Lowry, Michael Fitzmaurice, Peter Fitzpatrick, and former Sinn Féin TD Carol Nolan. The seven abstentions included Fianna Fáil members, many of whom also campaigned for a no vote in the referendum. John Curran, Pat Casey, Mary Butler, Aindreas Moynihan, Eugene Murphy, Charlie McConalogue and Sean Haughey were all absent from the chamber. A number of members are understood to be attending the British Irish Parliamentary Assembly in London today. Email “'Disciplinary proceedings' to be initiated against Tóibín for breaking ranks on abortion legislation ”. Feedback on “'Disciplinary proceedings' to be initiated against Tóibín for breaking ranks on abortion legislation ”.